Kazakhstan was site of the Soviet Union’s first atomic bomb: The Kazak people are still feeling the aftereffects of radiation. Kazakhstan’s steppe was ground zero for the Soviet Union’s atomic bomb. What does a nuclear wasteland look like? Wyoming. 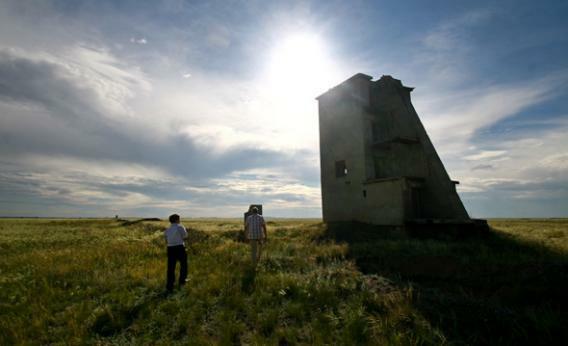 Yuriy Strilchuck, center, in Semipalatinsk, Kazakhstan’s nuclear testing site. SEMIPALATINSK, Kazakhstan—An hour’s drive down a rutted dirt track in eastern Kazakhstan is an expanse of steppe as big as Belgium, 50 miles from the nearest town. It’s called the Polygon. The land here is treeless and quiet, tawny grass from horizon to horizon, dotted with purple thistles and yellow wildflowers. At its center, a shallow depression is filled with thicker, greener grass. Above it, swallows flit in a breeze that smells of sage. This is what a nuclear wasteland looks like. It looks like Wyoming. Yuriy Strilchuk, head of training for the National Nuclear Centre of Kazakhstan, is clutching a beeping Geiger counter. He won’t let a group of American journalists off the bus without two shower caps over our shoes and masks on our faces. Strilchuk, a sturdy man with a long goatee and ponytail, first came to this place in 1990 as a Soviet soldier. Now he comes as a tour guide to a nuclear apocalypse. He steps off the bus with plastic on his loafers but no mask on his face, and takes his position before the dimple in the earth. This is ground zero for the Soviet nuclear program. On Aug. 29, 1949, the Soviet Union detonated its first atomic bomb in this spot, a 22.4 kiloton explosion codenamed “First Lightning,” that launched the nuclear arms race. Four years later, the same earth shook with the Moscow’s first thermonuclear bomb—a 400 kiloton explosion 26 times more powerful than the bomb the United States dropped on Hiroshima. Looking out from the epicenter of these blasts, you can still see remnants of structures the Soviets built to test the power of these explosions. To the right are the crumpled remains of a bridge. To the left are fortified bunkers and barracks that had been filled with dogs, pigs, and goats to approximate the effects a blast would have on soldiers. In a line in both directions, 10 four-story concrete buildings rise from the Earth like the moai of Easter Island. These structures were filled with sensors to measure the explosions. Strilchuk calls them “geese,” because from a distance that’s what they look like: giant goose necks craning up from the grass, facing the place where man played God. From 1949 to 1989, the Soviet Union conducted 456 nuclear tests here, 116 of them above-ground. (Surface testing was eventually banned in 1963.) Strilchuk recounts this history dispassionately. But after fielding questions, he reveals a twinge of patriotism. He bends to pick three obsidian-like pebbles from the ground, soil chunks that lifted into the air in a mushroom cloud and metamorphosed into glass by the ferocious power of splitting atoms. “Drops of melted earth,” Strilchuk says. After the fall of the Soviet Union, the newly independent Kazakhstan inherited the fourth-largest nuclear arsenal in the world. It also acquired the radioactive legacy of four decades of nuclear testing. President Nursultan Nazarbayev, in power from the beginning, decided to dismantle the warheads to make nonproliferation a defining characteristic of his new country’s identity. The radioactive contamination, however, has been harder to undo. Semipalatinsk, Kazakhstan’s nuclear testing site. 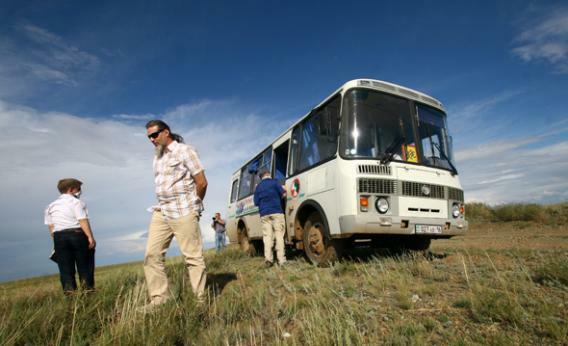 According to Kazakhstan’s Research Institute for Radiation Medicine and Ecology, about 1.5 million people lived in the test site area during the nuclear tests. Hundreds of thousands experienced direct radiation. Marat Sandybayev, director of the Semey Oncology Center, says the cancer rate in eastern Kazakhstan is two to three times the national average, and the tumors are aggressive. “The mortality rate here is much higher than average,” he says. The Oncology Center now treats the children and grandchildren of the original testing victims. Cancer wasn’t the only side effect of the nuclear testing. The residents around the testing site have experienced birth defects, mental disabilities, and infertility. Even more troubling is the region’s suicide rate. A 2001 report indicates that within a 60-kilometer zone around the test site, the suicide rate is more than four times the national average. Himan Stameltova grew up 30 kilometers away from the test site. “They have a special cemetery for people who kill themselves,” she says. “It’s full.” Among the graves is that of a 10-year-old boy. 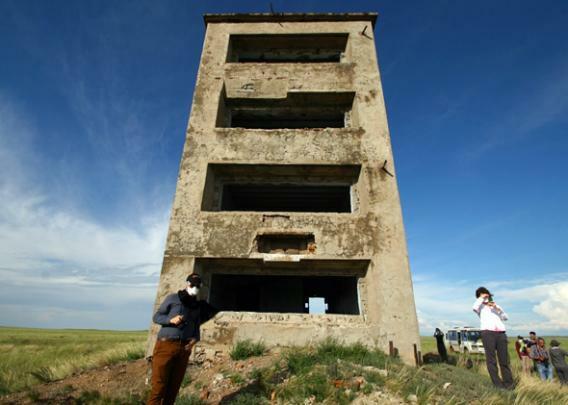 Twenty-three years after the Semipalatinsk test site was closed, there is no fence surrounding it, nor are their signs marking the ground as contaminated. Anyone can drive onto it. Local scavengers have stripped the site of its scrap metal, even using backhoes to dig up buried copper cables. They sold the radioactive metal to recycling plants. The scavenging alarmed U.S. and Russian nuclear watchdogs who knew that unsecured weapons-grade uranium and plutonium remained in tunnels on the site. A covert collaboration between the United States, Kazakhstan, and Russia called Operation Groundhog just finished filling these tunnels with concrete last year. Today, hundreds of Kazakh shepherds still graze their animals on the site. Their presence is technically illegal, but no one is there to turn them away. Scientists on an experimental farm on the site are testing the transference of radioactivity from grass to sheep. The government has opened a portion of the site to beryllium, coal, and gold mining, estimating that 80 percent of the test site has safe levels of contamination and could eventually be used for mining or agriculture. The government’s optimism for the Semipalatinsk test site reflects Kazakhstan’s emergence from a Soviet nuclear wasteland into a prosperous capitalist economy. Kazakhstan has come to terms with its history quicker than most former Soviet republics. A wealthy, resource-rich country, Kazakhstan is broadening its profile as a leader of the nonproliferation movement by hosting negotiations on Iran’s nuclear program. They’ve volunteered to establish an international nuclear fuel bank, a measure of nuclear security that the International Atomic Energy Agency is seriously considering. The government even talks of building a nuclear energy reactor of its own, a peaceful application of the fierce atomic power that the Soviet Union once wrought upon the Kazakh steppe. 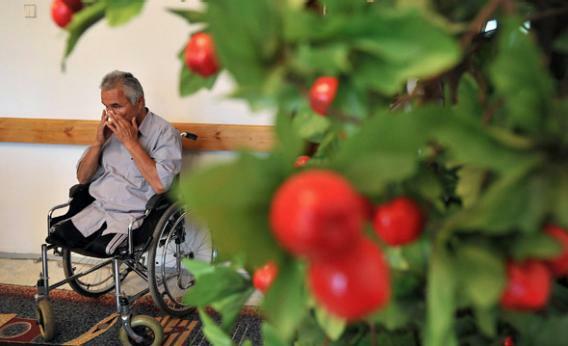 Kadyrbek Nurtazinov, 58, sits in a retirement home as he lost both of his legs because of radioactive irradiation, in Semipalatinsk, Kazakhstan, on August 21, 2011. For now, walking through the test site is a surreal juxtaposition of danger and beauty. The radiation is invisible, silent, and odorless. The sea of grass, undulating softly in the wind, looks like the American prairie. The scene is oddly peaceful.